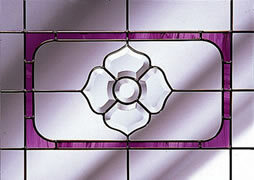 Stained glass, coloured glass, bevelled glass designs. Choose carefully, your choosing for life! 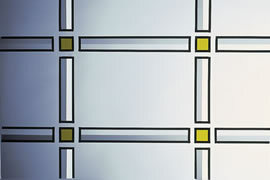 A variety of different styles of glass are available to suit your home, from clear glass through to bevelled or diamond cut. On this page are a few samples of what we have on offer. Again, there are many kinds of glass to choose from with special qualities that need to be taken into account when choosing your windows. The best known is Pilkington K - it has a microscopic metal coating that keeps up to 30% more heat in by actually reflecting it back indoors. 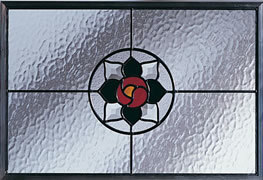 You can also keep in more heat with argon gas filled between the glass panels. But remember, these will keep in the heat in summer too (please ask for our ventilation options). Previously, heat saving glass and frames were simply a matter of choice but new building regulations or standards mean the components of every window or conservatory must be up to certain standards of heat retention throughout. Created by a special cooling process, is around 7 times stronger than conventional. Also if it is broken it shatters into tiny blunt pieces instead of razor sharp shards as with ordinary glass. Its use is obligatory anywhere lower than 800mm (31 inches) above ground level, but you might also consider it anywhere that the young or infirm may be able to reach, such as a window above a bed. This has a sheet of film sandwiched between two layers of glass. This means even if a would-be intruder manages to break the glass the film remains intact, preventing opportunistic burglars from climbing through without a lot of noise or wasted time. All double glazing keeps out more noise than ordinary single glazing but the effectiveness actually depends on the space between the two panes - the wider the space, the quieter it gets. Pilkington K Glass keeps your home warmer by reflecting the heat from inside back into the room, rather than letting it escape. While this has positive benefits for the environment, it also has great benefits for you. 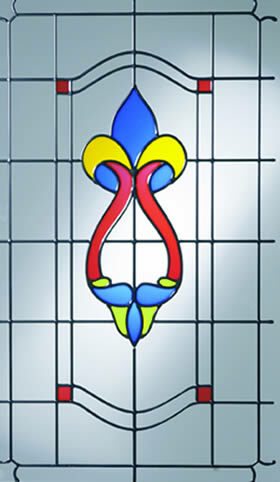 Allows you to increase the glazed area of a building without increasing heat loss.